It's hard to go wrong with Voxengo plug-ins, and HarmoniEQ only strengthens that perception. Highly configurable. Dynamic and harmonic enhancement. Multichannel and mid/side processing. Narrow-band sweep auditioning. Dynamic range metering function. Up to 8x oversampling. Affordable. The announcement of a new EQ plug-in causes about as much office excitement as someone commenting that the bin-liner needs changing. Admittedly on a slow day people do fight over who's going to do it, but usually no one goes out of their way to investigate such things. Most DAW jockeys will have compared the bundled plug-ins that came with their software to third-party products, and know that different EQs give different results. Where does Voxengo's recently updated HarmoniEQ sit among its peers? Version 1 of HarmoniEQ was far simpler; essentially a great-sounding EQ with the twist of harmonic and dynamic enhancement. Version 2 not only improves on all that, but has extra welly in the form of additional filter types (LP, HP, notch), an internal routing matrix capable of MS encoding/decoding, and multiple simultaneous EQ capability. This makes HarmoniEQ v2 a high-end one-stop EQ solution for any kind of audio work, including serious multichannel applications. 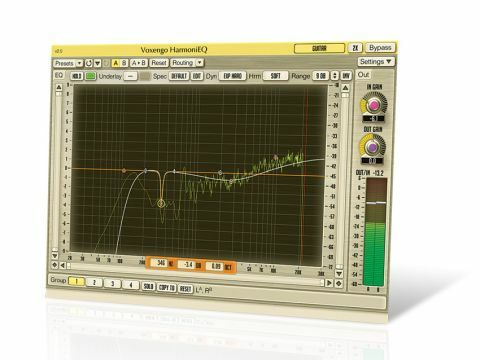 The GUI is a customisable and scalable window dominated by the EQ window, where the EQ curve, seven filter nodes and real-time spectrum analysis live. A wealth of workflow enhancing features have been added, such as undo history, channel grouping/naming, contextual hints, preset manager and so on. HarmoniEQ enables you to route multiple audio inputs to certain groups that share an EQ curve. For example, you could take a 7.1 surround mix and EQ the four rear surrounds with one curve, the main LR with another, and have individual EQs for the C and LFE, all in one instance of the plug-in. One of the preset routings is MS, standing for Mid and Side. This is a method of dealing with your audio as centre and stereo signals, enabling you to EQ them differently. This is great for mastering, where you might treat the top end of the centre signal to correct a vocal EQ, while taking some flappy bottom end away from the extreme left and right parts of the mix, thus tightening up the bass. The inputs, outputs and groups can be saved, and the curves from different groups can also be displayed, copied and pasted. Voxengo products aside, we're not aware of any other plug-ins that offer such flexible yet straightforward multichannel operation. Each of the seven filter nodes can be any of the available types: peak, low/high shelf, notch, band-pass and 12dB and 24dB varieties of high and low-pass. Nodes can be yanked around freely, with the Alt key enabling adjustment of Q. Extremely narrow bands are available (down to 0.01 octave) for super-accurate remedial work, and nodes can be selected and moved as a group. Holding Cmd+Ctrl while click-dragging on the graph temporarily enables a narrow band-pass filter, which you can sweep through the spectrum to identify problem frequencies. The optional dynamics and harmonics sections are what make HarmoniEQ stand out from the crowd. The dynamics processing offers soft, hard and 'extra' modes, and can either expand or compress the transients affected by the EQ. The compression reigns in transients that are boosted by the EQ, so you can EQ without dramatically increasing peak levels. Expansion works the other way around, by expanding (ie, enhancing) transients in a specific frequency range for added excitement. The harmonics processing is applied to each band individually, so the more bands are active, the more saturation you hear. The effect adds subtle second and third-harmonic overtones, which has a satisfying thickening effect. HarmoniEQ is a superb-sounding EQ that can make sounds come alive in a unique way. The only possible caveat is that it introduces 11ms of latency. This is only really a concern if you want to use it live, or if your DAW doesn't have latency compensation (eg, Pro Tools LE). Overall, it's another typically excellent effort from Voxengo.